From flood and storm water to a faulty household appliance, unwanted water is one of the greatest threats to your property. Puroclean has the experience, technology and response you need to restore your property and get your life back on track. Specializing in advanced drying and dehumidification techniques, Puroclean rapidly removes water and moisture from carpets, floors and walls. We minimize the disruption, so you can get back to your home or work. The result can save property owners and insurance companies valuable time and money. Homeowner’s insurance generally covers household water damage if the damage is sudden and accidental, such as damage caused by burst pipes. It does not cover damage of the sort covered by flood insurance, i.e., rising water from outside; or damage caused over time by lack of maintenance. A water damage claim can be a red flag to insurers as well as to future homebuyers, signaling a likelihood of repeat water claims. It is better to maintain a home for water issues than face the risks of increased insurance costs and reduced home marketability. Look at your water bill. By comparing monthly usage figures, you may get tipped off to a small leak before it becomes a big problem. Major, unexplained fluctuations in your water bill are often a sign of water leaks. Use a water pressure gauge to determine whether your household water pressure is set too high. The ideal household water pressure is 60-80 pounds per square inch (psi), but many homes are set at 100 or higher. Attach the gauge to an outdoor faucet and turn the water on full to determine water pressure. Inspect pipes and fittings each year. Just as you change the batteries in your smoke detector each year, you should take a few minutes to inspect under sinks and around washing machines, lavatories, ice makers and water softeners. Know where your water shutoff valve is located and be sure that the entire family knows how to shut off household water supplies in the event of a sudden pipe or hose break. Inspect your plumbing annually. Just as you change the batteries in your household smoke detectors each year, you should inspect your water pipes and fittings annually. This is a simple check that takes minutes, and could prevent thousands of dollars in water damage. Inspect around your water heater, washer, dishwasher, sinks, lavatories and refrigerator icemaker. If hoses indicate wear, replace them. Consider replacing hoses to major appliances such as your washer and dishwasher every two to five years. Steel, so-called "no burst" hoses have been shown to have a longer lifespan than other models. When you go on vacation, turn off the water to your washer while you’re out of town. Many homeowners have returned from vacation to find their washer hoses have burst, flooding their homes. 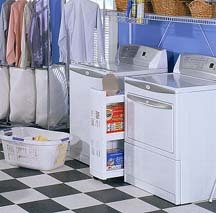 Never leave the house with appliances, such as dishwashers, washers or dyers, still operating. Repair window and door cracks with caulk and replace old or dried-out caulk. This helps to prevent water from seeping into the house from outside. Clean out gutters and downspouts regularly. This helps prevent overflowing, which may damage your roof. Let faucets connected to vulnerable pipes drip during extremely cold weather. This keeps the water moving and helps to reduce the chance of freezing. If your bathroom has an exhaust fan, be sure to run it while the shower is on. This helps to remove steam from the room. The Uniform Plumbing Code (UPC) calls for water to be delivered to homes for domestic use at between 50 to 70 psi. Angle stops (valves) and supply lines as well as appliances are designed to withstand up to 80 pounds per square inch. Water pressure regulators take the water as it is delivered by the water district, and regulate it to between 50 and 70 psi. The pieces in the water pressure regulator that reduce the water pressure are made of rubber and metal. Over a period of time, they can fail. When the water pressure regulator fails, water pressure to the home is allowed to increase. This puts a strain on valves, hoses and appliances that they were not designed to withstand. Unchecked, excessive water pressure may cause a rupture in the supply lines or valves. A water pressure test gauge can inform the homeowner if water pressure is excessive. Simply connect the gauge to an outdoor faucet, and turn on the water to determine the water pressure. Make sure the faucet used is "regulated". Some outdoor faucets are unregulated. If the pipe connected to the faucet comes out of the wall, there is a fairly good chance that faucet is regulated. Generally speaking, replacing the water pressure regulator, including parts and labor, should cost much less than a homeowner’s standard $500 deductible. A working water pressure regulator reduces the strain on plumbing fixtures and increases their service life. Every homeowner should locate their main water shut off valve and know how to use it. There are two types of main water valves: the gate valve and the ball valve. The gate valve is recognized by its round handle that must be turned a number of times to open or close the valve. The ball valve is recognized by its single handle that needs to be turned 1/4 turn, or 90 degrees, to turn the water on or off. Your plumbing professional can tell you about the condition of the main water valve in your home and replace it if necessary. Angle stops are valves located under your kitchen and bathroom sinks, at your washing machine, at the toilet, and refrigerator icemaker. There are angle stops for both hot and cold water. Most angle stops are of the gate variety and are made of materials that may fail over time. Replacement of these valves is recommended when they are showing signs of leaking or they have "frozen" in the open position - meaning they can’t be turned one way or the other. A plumbing professional may be able to change out old angle stops with a new ball variety in a modest size home for less than the homeowner’s standard $500 deductible. Angle stops need to be "exercised" regularly to make sure they are not frozen in the open position. Every month or two simply turn the angle stops off and on a few times. This will keep them working as they were designed. Never force a valve that is frozen in position. Consult a plumbing professional as soon as possible. 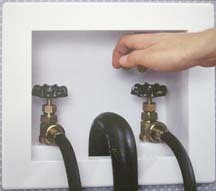 Water supply lines are connected from the angle stop to the appliance they serve, such as a faucet, toilet, washing machine, dishwasher and refrigerator icemaker. Many times these are thin rigid lines that can easily break and cause extensive damage. Water supply lines should be checked regularly for corrosion and rust and changed every 5 to 7 years. 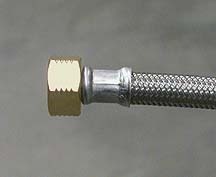 Among the preferred lines are those that are stainless steel braided over rubber with threaded couplings on both ends for the sink and toilet lines. Don’t forget the dishwasher and refrigerator icemaker supply lines. They are often overlooked because they are hidden. Replace plastic tubing with either soft copper or steel braided supply lines. The washing machine supply box shown is found in most recently constructed homes. The box sits inside the drywall and the angle stops are inside the box. The water to the washing machine should always be turned off when the machine is not in use. The instruction manuals for some washing machines call for the water to be on only when the machine is in use. Leaving the water on places the washing machine hoses and valves under constant pressure. The life of the washing machine hose can be prolonged if the water is turned on only when the machine is in use. Washing machine hoses need to be checked regularly and replaced periodically. Most failures occur at the coupling. Either type should be used in accordance with the washing machine manufacturer's recommendations. Always change hoses when a new machine is purchased, or you move to a new location. Regardless of the material the hose is made of, it needs to be checked and changed regularly. A broken washing machine supply line can cause extensive damage if it is not discovered quickly and the water turned off. Turn off water to the house. Immediately call a professional water damage restoration company like PuroClean Home Rescue who will dispatch a team of experts right away. Remove as much water as possible with mopping and blotting. Remove all photos, art and small fixtures to a safe, dry place. Wipe wooden furniture dry. Prop up cushions for even drying. Open drawers, cabinets and closets for faster drying. Put aluminum foil, saucers or wood blocks between furniture legs and wet carpeting. Remove rugs from on top of wet carpet to prevent color saturation. Remove items that are not colorfast, such as books and magazines, from wet flooring and carpet.